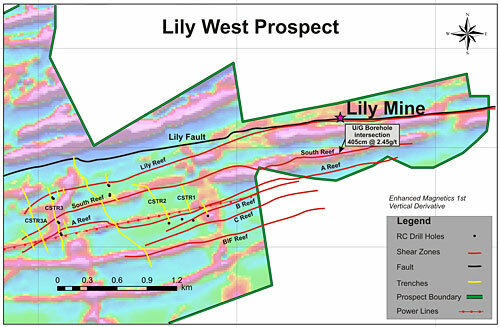 Magnetic anomalies along the western extension of the Lily Fault and parallel shear zones were tested by trenching and selected boreholes drilled by reverse circulation. Although encouraging assay results in the trenches led to follow up work being conducted on some of these structures, the initial phase of drilling did not expose gold mineralization that is sufficiently continuous to warrant immediate consideration for open pit mine planning. Further phases of drilling along strike of the mineralized structures are, however, planned for the future.